Think The Sims, but with a residential twist. Design Home (by Crowdstar/Glu Mobile) is a virtual design game that calls Kathy Kuo Home, Apt2B, United Strangers, CFC, Noir, Design Within Reach, Cynthia Rowley, Taylor Burke Home, Peninsula Home, Modloft, Serena & Lily, Worlds Away, Loloi and more its partners in design. Glu Mobile recently announced that the game, which launched last year, had reached 1 million users. The platform, which debuted last November, has generated more than 25.5 million downloads and $41.4 million in bookings through the end of the second quarter of this year. It has earned the distinction of #1 Top Free and #17 Top Grossing game in the U.S. for the iPhone; and #1 Top Free and #23 Top Grossing game in the U.S. Google Play Store. Users decorate virtual 3-D homes, such as beachfront properties or high-rise luxury condos, with “real” furniture and decor from the aforementioned designers and firms. The current inventory of pieces is 4,000, with hundreds added each day. Anthony Baratta, Selamat, Justina Blakeney and Florence Broadhurst will add their furniture and decor to the platform later in the year. 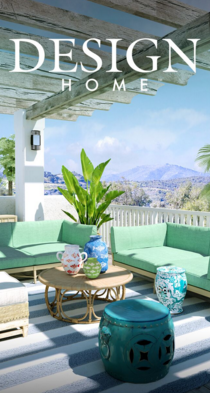 “Since launch, Design Home has captivated a large, global audience, many of whom don’t normally consider themselves traditional gamers,” said Nick Earl, Glu Mobile’s president and CEO.